Only have time for a couple interesting links from Scientific American I saw via Ruhlman. The first is the case against salt having much of an effect on blood pressure by Melinda Wenner Moyer and the second is an interview with Marion Nestle the other side. 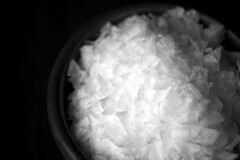 In brief: 1) intervention studies show little effect of low salt diets 2) but certain people seem to be very sensitive to salt while it doesn't effect others 3) and given the prevalence of processed foods and restaurants, are truly low salt diets even possible (1500 mg is less than a teaspoon of table salt)? I don't have any answers of course, but I tend to think it's not something to obsess over unless you have hypertension or family risk factors for it... but in either of those cases diet is the first thing I'd go after (with the approval of my doctor of course). Certainly cooking more meals at home is the safest way to go, even if you don't think salt's a big deal.